No, what the Brits have done to La Cage is just give it a good hard look – and if that good hard look marries La Cage’s phenomenal warmth to a deeper understanding of its main characters, so much the better. This La Cage is smaller than the original production: There are only six Cagelles, not 12, and the town of St. Tropez may seem a little bit less populated than before. But though this troupe of Cagelles may be tiny, it’s fierce. These guys weren’t cast to look like women but to look like the tallest, skinniest, most sinewy and scary female impersonators you can imagine. When they dance, they’re purposefully awful, and when they do their backstage business, you need to watch out. So this isn’t the deluxe nightclub you might expect: it’s more of a British music hall populated with unhinged French can-can girls, supervised by a Cockney matron who’s known to open her robe and reveal little propellers on her breasts. It’s all that the slightly smarmy master of ceremonies can do to keep order in the place – and you fear that he might have his dangerous side too. What’s eye-opening about this production is that all that wildness seems perfectly in keeping with the sweet story at its center – the story of the devoted couple, Georges and Albin, and the wayward son who finally grows up. 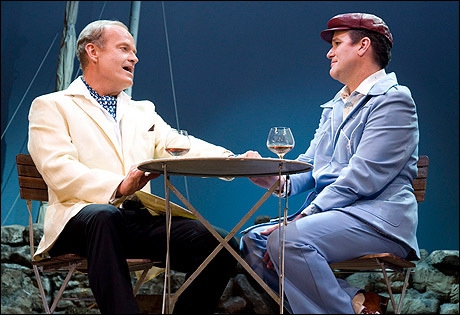 As Georges, Kelsey Grammer may get a little carried away with the hand-fluttering at the top of the show, but he also has a bit of the lounge lizard about him and a nicely sardonic air. 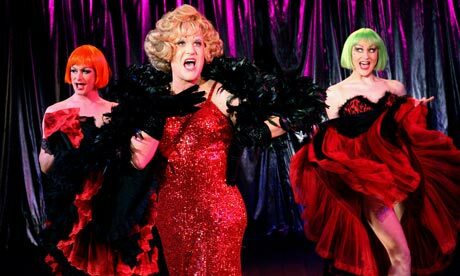 That slightly déclassé feel fits beautifully with Douglas Hodge’s glorious Albin, blowsy and Mermanesque as a woman but adorably middle-aged-boyish as a man. 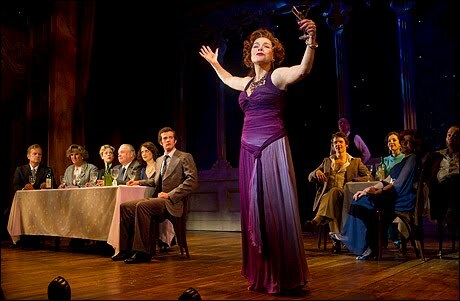 Hodge’s Zaza is more dangerous than her Cagelles: That’s where the British music-hall character comes in. But his Albin shows his true nature when the going gets tough: His maternal nature comes to the fore, and he fights as fiercely as any lioness to protect his family. There’s good work, too, from the other actors: A.J. 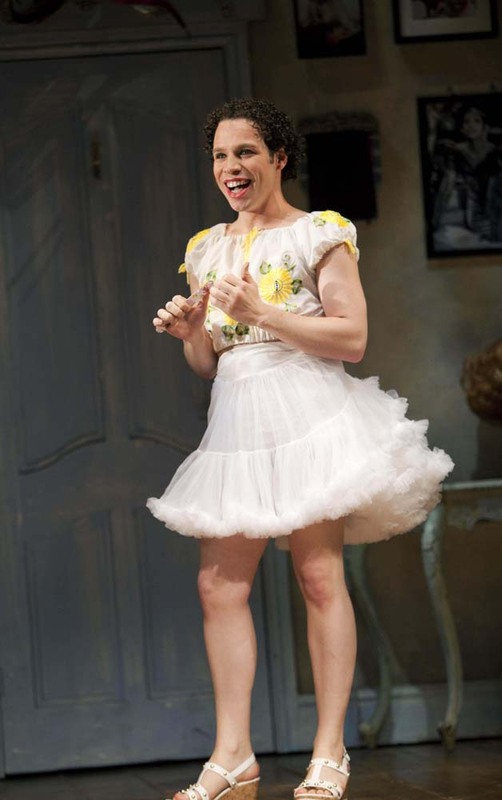 Shively doesn’t shy away from the callowness of the son, Jean-Michel; Christine Andreas makes a vibrant, larger-than-life Jacqueline; and Robin De Jesus (Sonny in the original production of Broadway’s In the Heights) is a stitch as a strangely Nuyorican Jacob, the maid/butler who only wants his chance onstage. Elena Shaddow is fine in the underwritten role of Anne (although she’s at the mercy of a truly terrible ‘70s wig), and it’s always a pleasure to see Fred Applegate and Veanne Cox, even though, as the Dindons, they’re playing cartoon characters here. There’s a warm, glorious chemistry between the two lead actors, and that warmth infuses everything onstage: Again and again I felt myself grinning, and when Jean-Michel began singing “With Anne on My Arm,” I heard someone in my vicinity humming along and was afraid it was me. This La Cage feels both safe and subversive. That’s a glorious place to be. This entry was posted in Broadway, Celebrities, New York theater, Reviews, Uncategorized and tagged Broadway, douglas hodge, kelsey grammer, la cage aux folles. Bookmark the permalink. You slay me! I don’t think you’ve liked a wig on any Anne ever! The production is marvelous, isn’t it? I found Hodge’s performance rather revelatory. I just adored him. I adored him too. Wonderful. But with Anne it’s like they were trying to get her to look like Kate Jackson on Charley’s Angels. I mean, what’s with that? I thought that they were TRYING (not too hard, mind you) to capture the look and period of the original French film. The curly Peter Brady with sideburns hair on Jean Michel and the wide lapels and the brown leather jacket screamed 70’s to me. The same went for Anne’s look.The rest of the costumes made absolutely no period specific statement. (other than perhaps some of the drag wigs) That was my minor quibble with the production. Otherwise, I was simply thrilled to see a production that proves you don’t necessarily have to have an MGM budget to do the show. Yes, that ‘s definitely what they were going for. I just think that Anne (who doesn’t have much to do, after all) becomes a victim of her wig. Not all women in the ’70s had hair like that — and I suspect Mme. Dindon wouldn’t have allowed it! Yay! We’re going tomorrow night (5/19). Looking forward to it! I never got to see Sam on Broadway (although I did see him in a wonderful local version thereof). I think you’ll enjoy this one too. I’m still singing (to myself, thank you very much).